In a press conference with Nevada governor Brian Sandoval today, Senator Dean Heller joined his colleague Susan Collins in taking a very negative, and possibly irreconcilable, position on the Senate version of the American Health Care Act. After Sandoval — a Republican who supported a Medicaid expansion for his state — made the case for keeping the expansion intact (which both House and Senate versions of the AHCA end), Heller said he could not support the bill as written at this time. But more important, like Collins, Heller set out conditions for getting his support that it’s unlikely Mitch McConnell could meet without blowing up his entire coalition. The Nevada senator, generally considered the most vulnerable Republican up for reelection next year, objected to a number of features in the Senate version of the AHCA, but his bottom line seemed to be that any cancellation of the Medicaid expansion would be unacceptable to him unless another key feature of the bill, the per capita cap on Medicaid spending, is significantly relaxed. Other Senate “moderates” seem to be angling for a slower phase-out of the expansion and a slightly more liberal cap. Heller appears to be large steps away from that position, and explicitly said, “It’s going to be very difficult to get me to a yes.” Furthermore, Heller kept citing Sandoval’s assessment of the bill as critical to his thinking, which means he already has “cover” for what would be a step that may anger Nevada Republicans. 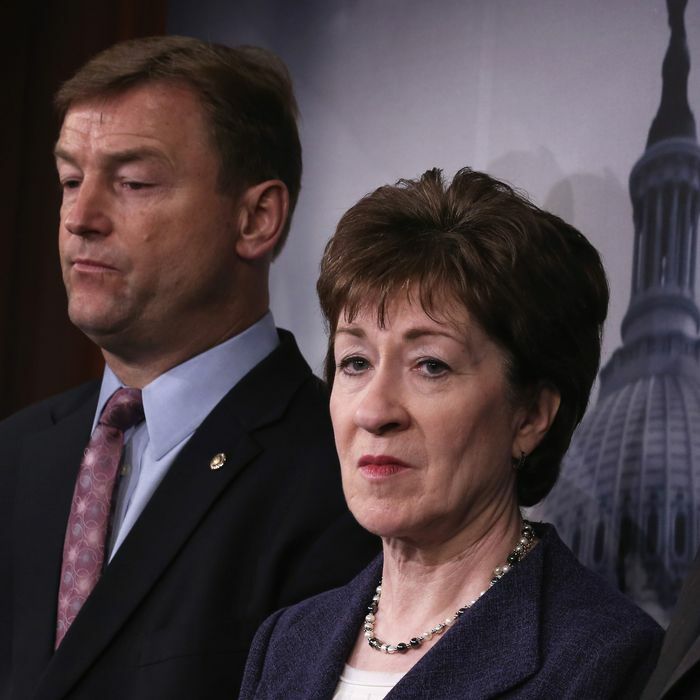 In almost the exact words used yesterday by Collins, Heller said he could not support any bill that took away health insurance from “tens of millions of people.” This appears to be an allusion to the Congressional Budget Office’s determination that the House bill would eliminate insurance for 23 million people — 14 million of them through the very Medicaid provisions Heller was criticizing most. It is possible if not likely that the CBO score of the Senate draft — due early next week — will significantly improve that number. Improving it by “tens of millions” would really be a stretch. For the moment, then, you’d probably need to count Heller and Collins as reasonably firm “no” votes on AHCA. That means McConnell cannot lose any more senators and still pass the bill. Aside from the elimination of his margin of error, that means every single Republican senator has enormous leverage over the bill’s managers. If there is anything they want, on health care or perhaps anything else, they will soon have their hands out, much like the House members who cut special deals for themselves and their constituents. If there is going to be a 50th vote for AHCA, it will be very expensive. And that could lead to additional problems when the House has its final say.